Flying Wild Hog, Devolver Digital, Laced Records and rock legend Stan Bush have announced the Warrior EP, a limited edition four-track vinyl record with music from and inspired by the upcoming first-person slasher Shadow Warrior 2. 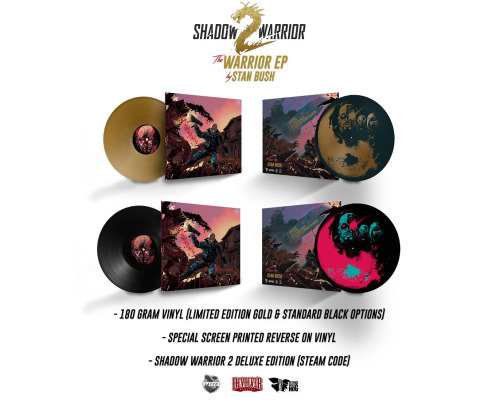 The limited edition gold vinyl and standard vinyl are available to pre-order now for $60/€54/£46 from Laced Records and includes a downloadable Steam code for Shadow Warrior 2 Deluxe delivered on the game’s October 13th launch day. The Warrior EP contains Warrior, an original track for Shadow Warrior 2 by Stan Bush, alongside classic rock anthems The Touch, Never Surrender, and The Touch (Lo Wang Hijack), a remastered duet between Stan Bush and the protagonist of Shadow Warrior, Lo Wang. The limited edition set comes with a Steam code to download Shadow Warrior 2 Deluxe that includes the game, the digital soundtrack, the Razorback katana, and the Solid Gold DLC pack. The Warrior EP is printed on luscious 180-gram vinyl with a special screen-printed reverse and presented inside a premium card sleeve designed by noted Polish comic artist Michal Sledzinski. Worldwide icon of melodic rock Stan Bush is best known for his song “The Touch,” made famous by Transformers: The Movie (1986) and appearing in the memorable opening cinematic of the 2013 Shadow Warrior reboot by Flying Wild Hog and Devolver Digital. As a vocalist, Stan has sung on albums by renowned artists such as Alice Cooper and Jefferson Starship, and has worked with iconic top producers (Georgio Moroder, Mick Jones, Peter Frampton, Paul Stanley, Ron Nevison, Richie Zito,) in addition to lending his voice to national and international advertising campaigns for Toyota, Coors, Mazda, Budweiser, Hertz and more. Shadow Warrior 2 is the stunning evolution of Flying Wild Hog’s offbeat first-person shooter following the further misadventures of former corporate shogun Lo Wang. Now surviving as a reclusive mercenary on the edge of a corrupted world, the formidable warrior must again wield a devastating combination of guns, blades, magic and wit to strike down the demonic legions overwhelming the world he inadvertently corrupted. Battle alongside allies online in four-player co-op or go it alone in this inventive sequel to the best-selling remake from 2013. Complete outrageous missions, collect powerful new armor, arcane relics of legend and choose from an array of masterfully designed weaponry – including a katana chainsaw that allows you to carve up your enemies in real-time. Finesse is the name of the game when it comes to dynamic dismemberment. The Warrior EP is available for preorder now and shipping out in November with game keys being delivered on October 13. Shadow Warrior 2 is set to launch on PC October 13 and is available now for preorder on Steam, GOG, and Humble with up to 20% off for Shadow Warrior owners. For news and information on development, follow @ShadowWarrior on Twitter or visit shadowwarrior.com.